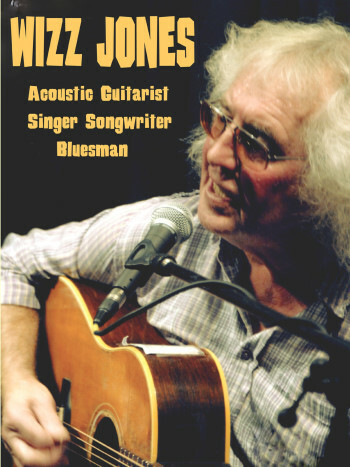 Wizz Jones has spent the last fifty years trying to play the guitar like Big Bill Broonzy and Davy Graham. Wizz has become known as a "musician's musician" (in other words - nobody's heard of him!). Still, he has made a sort of a living by strumming his old Epiphone Texan guitar in clubs, bars and festivals across the world. He's still out there somewhere, gladdening the hearts of acoustic guitar anoraks amd more recently, many young enthusiasts of the new acoustic scene. Wizz plays mostly solo but sometimes he can be heard ripping it up with son Simeon on sax, flute and harmonica.